Speak Life By Watching What You Say! Jesus spoke life, and, moreover, he is the Way, the Truth and the Life (John 14:6). One day Jesus entered the home of a twelve year old girl who had died, and he spoke words of life to her, commanding her to rise and get up, and amazingly, she did (see Mark 5: 22-43)! 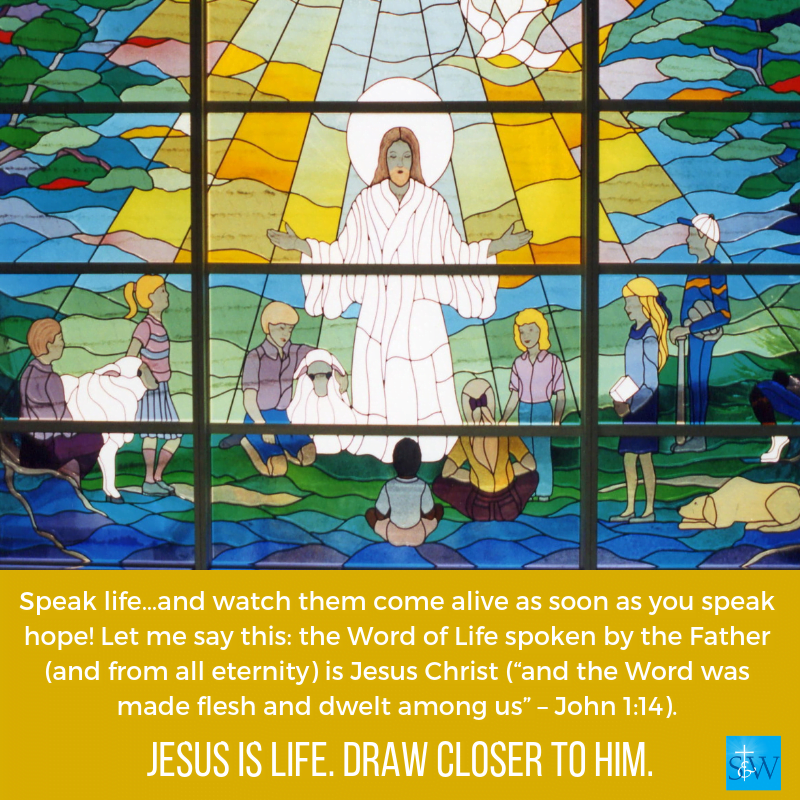 Jesus not only spoke words of life, but of Eternal Life, of unceasing life. “In the preaching of Jesus,” says Father Garrigou-Lagrange, “everything is immediately directed to eternal life.” Jesus is the principle of Eternal Life. God the Father spoke words of life and encouragement to Jesus, saying, “This is my beloved son, in whom I am well pleased” (Matthew 17:5). Have you spoken life-giving words to your children as the Eternal Father did to Jesus? Speak life…and watch them come alive as soon as you speak hope! Let me say this: the Word of Life spoken by the Father (and from all eternity) is Jesus Christ (“and the Word was made flesh and dwelt among us” – John 1:14). Jesus is Life. Draw closer to Him. But how often do we not speak life? Worse than that, how often do we speak words of spiritual death? How often do we hurt other people because of mean or poorly chosen words? “We must bridle the old, natural tongue. Children, above all arts, learn the art of guarding your tongue, and be careful about what you say, or no good will ever come of you. See to it that your words are to God’a honor, to your neighbor’s improvement, and to your own peace…. Your conversation should rest upon a solid basis of virtue rather than on glib speaking and subtleties. And you should speak with restraint and advisedly. By ill-considered words you can bring [great harm] on yourselves and on your hearers” (Spiritual Conferences, p. 184). Jesus speaks life. We see throughout the Gospels the tremendous and extraordinary power Jesus possessed to affirm others! People in the presence of the most dire circumstances suddenly find their lives transformed by the dynamic, affirming presence of Jesus. Whether it be the woman at the well, Zacchaeus (the dishonest tax collector), the woman caught in adultery, the man who came to Jesus through an opening in the roof, or the immoral woman who dried Jesus’ feet with her hair, Jesus is authentically open to them, he makes time for them, he affirms and does not condemn them, and ultimately he liberates them from the tyranny of sin. Thus, as one example, he says to the woman caught in adultery: “Has no one condemned you? Neither do I condemn you; go, and from now on sin no more” (John 8:10-11). And Zacchaeus comes away from his encounter with Jesus vowing to make restitution to all those he has defrauded (Luke 19:8). 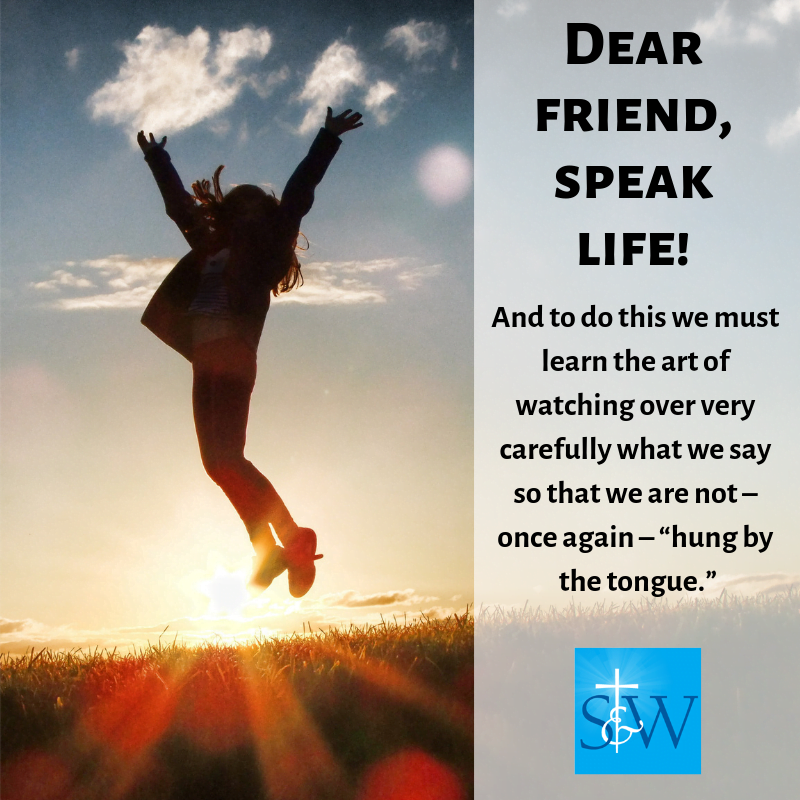 Dear friend, speak life! And to do this we must learn the art of watching over very carefully what we say so that we are not – once again – “hung by the tongue.” Learn the art of guarding your tongue, and in the process you will become, more and more, a person who speaks life to the benefit of all who share in the grace of your kind and transforming speech! 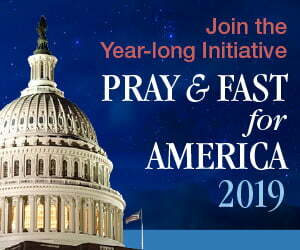 Spiritual principle: The key and tremendously important spiritual principle being advanced here is watchfulness, whereby we keep a keen spiritual eye on what we are thinking and saying so as to bring our thoughts and speech under the law of Christian charity. Saint Paul says that we “take captive every thought to make it obedient to Christ” (2 Cor. 10:5).